But only 1 - Bright Roofing - is dedicated to responding to your emergencies quickly, offering immediate solutions to your problems, providing qualified and guaranteed work, while properly communicating with you throughout the entire process. What makes Bright Roofing special? Quick response time. When you have water pouring into your building, no one wants to hear the words, “We will be there when the rain stops.” We promise to have our people on site in 5 hours or less. Fixing the problem right. 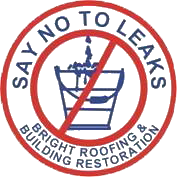 Roof leaks can sometimes be tricky. We eliminate the possibilities of water entry, starting with the most obvious. Communication is always important, no matter what you do. We communicate our information about your roof by any means that works for you. Whether it’s by phone, email, photos, or face to face, we will tell you what you need to know. Grandma Brightman’s third husband, Arthur, lived here on 15th Street in the 1940’s. Arthur and my Dad, Bill Daniels, started roofing and sheet metal as Bright in 1951. 3 generations later, and we are still here. The oldest roofing company in Detroit. The growth of CBA membership has expanded our neighborhood outreach. There’s just a lot more business activity around here now as compared to 10 years ago. Over these years, we have worked with over 30 Corktown business neighbors. What are some goals or upcoming announcements for Bright Roofing? Third generation Kelly Nelles has started a Woman Business Enterprise called Corktown Contracting. It’s mission is to assist corporations that are diversity minded and are looking for local help in their supply chain.